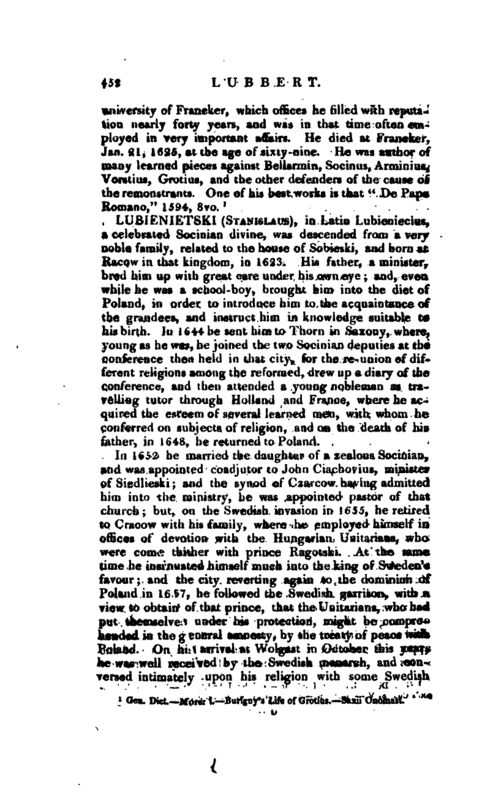 , in Latin Lubieniecius, a celebrated Socinian divine, was descended from a very noble family, related to the house of Sobieski, and born at Racow in that kingdom, in 1612—3. His father, a minister, bred him up with great care under his own eye; and, even while he was a school-boy, brought him into the diet of Poland, in order to introduce him to the acquaintance of the grandees, and instruct him in knowledge suitable to his birth, fn 1644 he sent him to Thorn in Saxony, where, young as he was, he joined the two Socinian deputies at the conference then held in that city, for the re-union of different religions among the reformed, drew up a diary of the conference, and then attended a young nobleman as travelling tutor through Holland and France, where he acquired the esteem of several learned men, with whom he conferred on subjects of religion, and on the death of his father, in 1648, he returned to Poland. In 1652 he married the daughter of a zealous Socinian, and was appointed ro:idjntor to John Ciachovuis, minister of Siedlieski; and the synod of Czarcow having admitted him into the ministry, he was appointed pastor of that tliurch; but, on the Swedish invasion in 1655, he retired to Cracow with his family, where he employed himself in offices of devotion with the Hungarian Unitarians, who were come thither with prince Ragotski. At the same time he insinuated himself much into the king of Sweden’s favour; and the city reverting again to the dominion of Poland in 1657, he followed the Swedish garrison, with a view to obtain of that prinpe, that the Unitarians, who had put themselves under his protection, might be comprehended in the general amnesty, by the treaty of peace with Poland. On his arrival at Wolgast in October this year, he was well received by the Swedish monarch, and conversed intimately upon his religion with some Swedish | lords; but when the peace was concluded at Oliva, he was disappointed in his object, and the Unitarians were excepted out of the general amnesty granted to all other dissenters from popery. On this, instead of returning into Poland, he embarked for Copenhagen, in order to seek a settlement there for his exiled brethren, and arrived in that city in Nov. 1-660, where he made himself very acceptable to the Daijish no* bility. He had an extensive epistolary correspondence, which furnished him with many particulars from foreign countries. With this news he entertained the nobility; and, when it was read to the king (Frederic III.) he was so delighted with it, that he created a new place for him, that of secretary for transcribing these news-letters for his majesty’s use, and he was promised an annual pension for it. The king, who never received him at court, but often heard him discourse on religious subjects, engaged his confessor in a controversy with Lubienietski in the royal presence. But this giving umbrage to the Lutheran divines, Frederick found it necessary to tell him privately that all he could grant him was to connive at his followers settling at Altena. 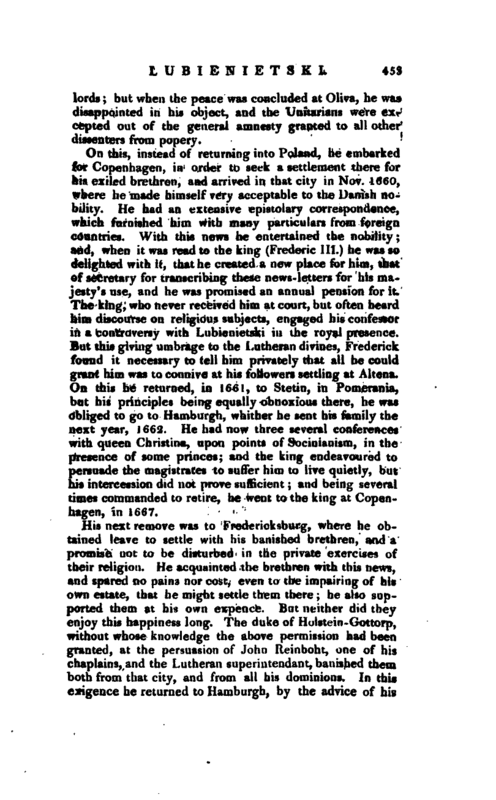 On this he returned, in 1661, to Stetin, in Pomerania, but his principles being equally obnoxious there, he was obliged to go to Hamburgh, whither he sent his family the next year, 1662. 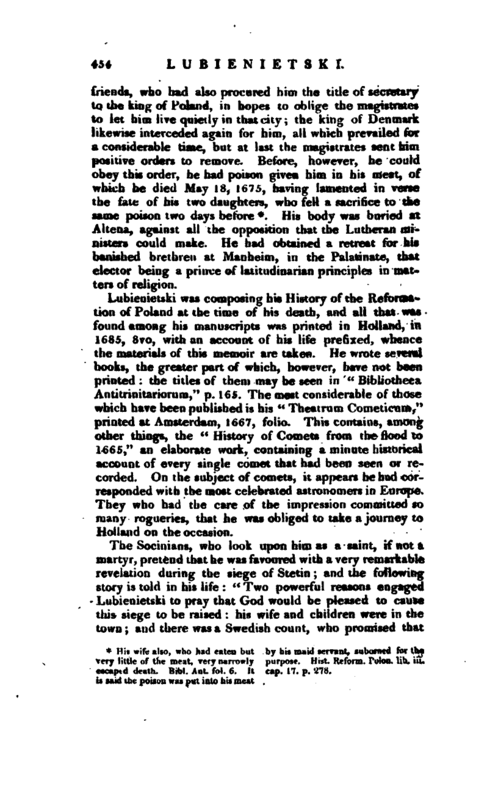 He had now three, several conferences with queen Christina, upon points of Socinianism, in the presence of some princes; and the king endeavoured to persuade the magistrates to suffer him to live quietly, but his intercession did not prove sufficient; and being several times commanded to retire, he went to the king at Copenhagen, in 1667. His wife also, who had eaten but very little of the meat, very narrowly escaped death. Bibl. Aut. vol. 6. It it said the poison was put into his meat by his maid servant, suborned for the purpose. Hist. Reform. Polon. lib. iii. cap. 17. P- 278. His body was buried at Altena, against all the opposition that the Lutheran ministers could make. He had obtained a retreat for his banished brethren at Manheim, in the Palatinate, that elector being a prince of latitudinarian principles in matters of religion. 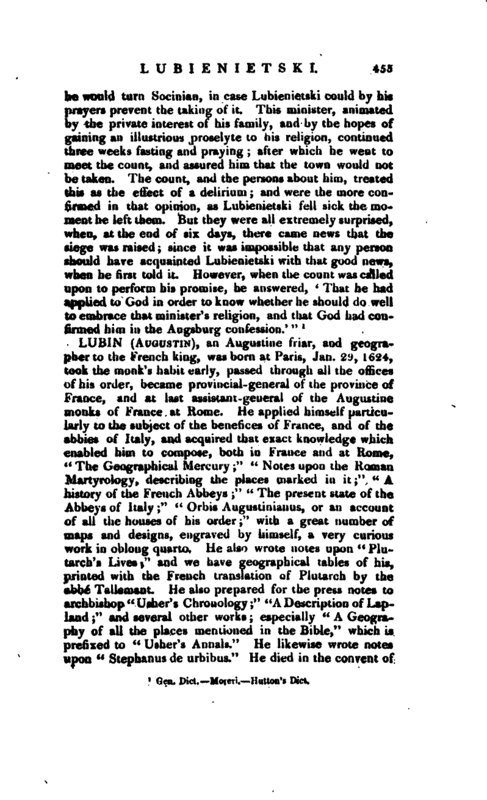 Lubienietski was composing his History of the Reformation of Poland at the time of his death, and nil that was found among his manuscripts Whs printed in Holland, in 1685, 8vo, with an account of his life prefixed, whence the materials of this memoir are taken. He wrote several books, the greater part of which, however, have not been printed: the titles of them may be seen in “Bibliotheca Antitrinitariorum,” p. 165. The most considerable of those which have been published is his “Theatrum Cometicum,” printed at Amsterdam, 1667, folio. This contains, among other things, the “History of Comets from the flood to 1665,” an elaborate work, containing a minute historical account of every single comet that had been seen or recorded. On the subject of comets, it appears he had corresponded with the most celebrated astronomers in Europe. They who had the care of the impression committed so many rogueries, that he was obliged to take a journey to Holland on the occasion. 1 Gen. Dict. —Moreri. —Hutton’s Dict.